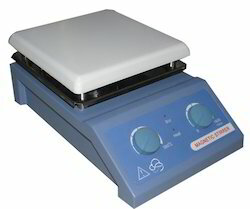 We are a leading Manufacturer of ceramic magnetic stirrer from Chennai, India. It is used when liquid heating is needed in industry, agriculture, health and medicine, scientific research and college labs etc. 1. Enclosed big size Ceramic Hot Plate with characteristics of flame protection and durability. 2. Heating and stirring can proceed simultaneously. 3. Heating power and stirring speed is stepless adjusted. Can show the setting temperature, hot plate surface temperature, setting speed and actual speed at the same time. Can show the setting temperature, tested liquid temperature, setting speed and actual speed at the same time.